Theresa's Haunted History of the Tri-State: Mountain Octopus? THOMAS, W. Va., Jan. 11 (AP)---Thomas school authorities were startled, to say the least, when a group of youths marched to classes bearing what they believe to be two octopuses taken from the turbulent Blackwater River. To add to the surprise, the youngsters said there were at least eight others in the swift flowing mountain stream in which ordinary fish find the going rough at time. Stelman W. Harper, principal of the Thomas grade and high school, and members of his staff searched all available biological text books and after comparison of the specimens with the description of octopuses, agreed that the boys had made an unusual discovery. One supposed octopus was taken from a miniature lake created by the Fairfax Electric Company power dam here, Harper said, adding that the water is warm the year around due to discharges from the plant's turbines. The other was found some distance below the dam. Harper said the boys shot the creatures with a small rifle while playing along the banks of the stream. They told him that they shot a third, weighing about 15 pounds, but threw it back into the water thinking it was not an unusual catch. A hurried call was placed with fish experts at Davis and Elkins College and Elkins in an effort to clear up the discovery. 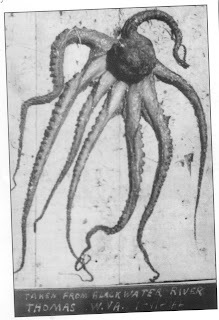 Harper reported that specimens preserved at the school had tentacles about two and a half feet long. He added that he had "no idea" how the creatures got into the stream, he expressed doubt they could have been placed there by a returned veteran from the South Pacific. Harper explained that it would have been almost impossible for anyone to have shipped them into the community without arousing curiosity, due to their size. The first supposed octopus was brought to the school yesterday by James Largent, a 12-year-old student. The second was proudly carried in by Philip Lamont, James Lamont, and Kenneth Liller. Still, I found the whole concept intriguing, and was pleasantly surprised to see some information on the subject online. Most of what I was able to find was simply a re-telling of the January, 1946 incident at Blackwater River, but it seems that the tri-state is actually a hotbed of sightings of these mountain octopi! On Christmas Eve, 1933, two men named Robert Trice and R.M. Sanders were fishing in the Kanawha River outside of Charleston, WV when they pulled a 3 foot long octopus-like creature out. Mark Hall later exposed this incident as a hoax, but other incidents dot the area as well. In 1955, a similar creature was spotted in a creek in Grafton, WV and in 1959, a specimen was found in the Licking River in Kentucky. These creatures have also been seen in the Ohio River, notably in Cincinatti and in Louisville, Ky. The most recent sightings come from 1999, and a 2006 incident in Ohio State Park. In some of the sightings, the creature is already dead, but in several, most notably the Blackwater River incident, the specimens were seen alive, which has led to many different theories about what these creatures are, and why they are here in this area, so far inland. The obvious explanation for more recent sightings tends to be released marine pets that are either dead, or no longer wanted. In fact, this was shown to be the cause in a couple of cases of these freshwater octopi found in locations outside the tri-state area, but they don't account for earlier sightings in which pets of this nature would have been more difficult to come by. In this category, we can also go ahead and add in deliberate hoax, which, as shown above, has happened in the past. However, others theorize that these might actually be octopi that have come mainland and gotten lost. Towards the end of an octopus' life, it goes through a senile phase called senescence, and can become lost and disoriented. Proponents of this theory do not, however, offer up a satisfactory reason as to how a saltwater creature can live for so long in fresh water, lol. 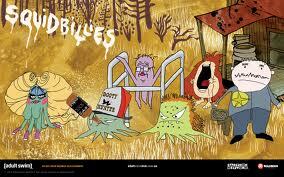 So that leaves one final theory....the theory that the mountain octopus is a new species: The Freshwater Cephalopod! I do find it interesting that this species does seem to be concentrated on one particular geographic location, as opposed to all over the United States, and WV IS known for its creepy cryptozoology, claiming other such oddities as Mothman, Sheepsquatch, and the similar creature, the Hoult River Monster . Whatever this creature may be, it has truly earned its place in West Virginia's Weird History! Was it a Ghost Seen in Barboursville? Hotel Morgan: Haunted or Not?